Can You Use Natural Stone in a Shower? Natural stone in the shower is largely about appearance. It looks great on shower walls, ceilings, and floors, as well as on the floor outside the shower. Where it's not so great is the areas of performance and maintenance. Stone must be sealed regularly, and it can be difficult to clean if it's highly textured or has wide grout lines. You can certainly use natural stone in a shower, but stick to stone tile or slabs and small grout joints, and choose a slip-resistant surface for shower floors. Seal the tile on a regular basis, exactly as directed by the tile supplier. Common types of stone used in showers include slate, marble, and granite, but other other stone species can be suitable. 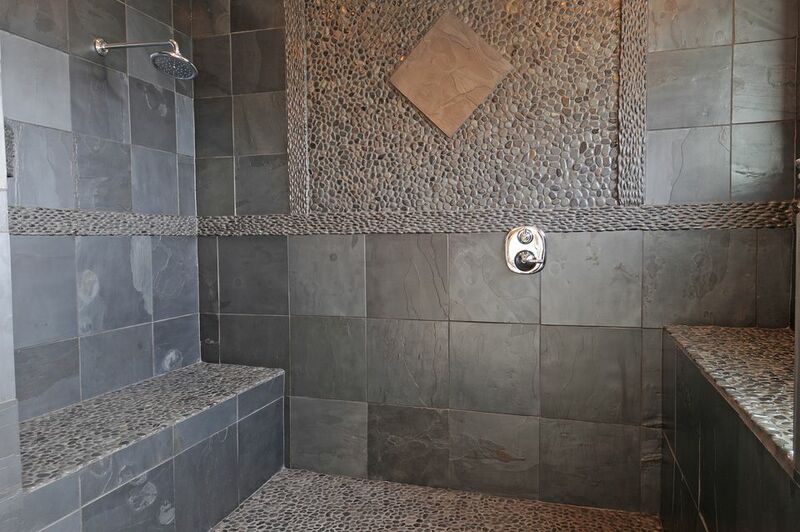 Slate tile is perhaps the most widely used form of stone in showers. If sealed properly and cleaned regularly, it's an all-around good performer in this application. Just make sure to use the right type of slate for showers; some types can flake and deteriorate over time. White marble is a popular choice for showers because of its light coloring; most people like light colors in bathrooms. Choose a high grade of white marble to ensure minimal veining and inclusions, which are vulnerable to damage in the shower environment. Lower grades of marble tend to have more veins and inclusions. Some marble has a relatively high iron content and can literally rust, discoloring the stone, if the stone is not properly sealed. Granite, particularly in lighter colors, also works well in showers. Many types of granite are not damaged by acid, ammonia, or alcohol, making them seem somewhat lower-risk or lower-maintenance than marble and some other natural stones, but this is a limited benefit since most people don't clean with alcohol or ammonia. As for acid, all stone should be cleaned with non-acidic or pH-neutral cleaners. Many natural stone products are smooth, while others are rough or highly textured. You can probably guess which is better for showers. If you've ever had a conventional tiled shower and experienced the joys of keeping the little (but numerous) grout lines clean and mildew-free, you can imagine what it would be like cleaning a shower that's basically all grout or at least textured like grout. The lesson here is simple: Use smooth—or relatively cleanable—stone, and if you use stone tile, keep the grout joints small. Grout, like textured stone, is gritty and therefore holds onto all the gunk that flies around in the shower. This lesson rules out two huge mistakes that people have made with stone in showers: pebble floors and stacked-stone walls. Pebble, or river rock, floors use round stones, and that means lots and lots of grout. Stacked-stone walls are not only roughly textured, but they're also completely riddled with nooks and crannies. No amount of sealer will keep water, soap, shampoo, or hair out of those crevices—even if it technically protects the surfaces of the stone. Most types of natural stone need to be sealed once a year. The best type and application of sealer depends on the stone, so this is something to learn from your stone supplier. Typically, a penetrating-type sealer is recommended for stone in showers. Topical sealers and enhancing sealers generally are discouraged because they can flake off over time or discolor the stone or grout in this wet environment. Stone sealed with penetrating sealer resists water to some degree, so the water may bead rather than soak in, but the stone still gets wet and simply has to dry out between showers. If you're putting stone on your shower floor, make sure it won't be slippery when wet, soapy, or even scummy. Shower accidents are often serious and almost always painful. Don't let your (or your designer's) aesthetic vision get in the way of practicality—or your desire to keep your bones intact.